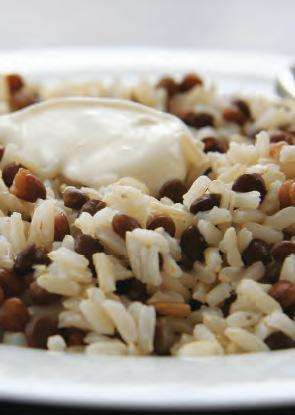 Brown Rice and Lentils – – Lentils (dry), Brown Rice, Olive Oil, Water, – Rinse lentils and discard any debris. Place lentils in a saucepan with water. Simmer for 20 minutes. Add the rice and cook another 30 minutes, until tender and all water is absorbed. Serve with a scoop of plain, full fat yogurt. Makes 2 cups (500 ml) rice and lentils.